Ronin Over the Limit CD RAE ET (Imp NZ) (Oliver) heeling at 3 months old with owner Jodie Munting. The Canine Good Citizen program run by the NZKC is designed to assess and reward dogs that have the temperament and training to be great members of their family and community. The exercises consist of heel work, stays, recalls, interaction with people, food manners and more. At Ronin Boxers we are gradually working through the levels with our dogs, and we're loving it! It is an excellent way to set achievable goals in training with your dog, and it feels great to finally receive the special NZKC certificate at the end. There are four levels of the Canine Good Citizen award, Foundation, Bronze, Silver and Gold. The CGC Foundation is similar to the American CGC and is largely about temperament, in each level beyond that the training requirements increase but still maintain the importance of good temperament. 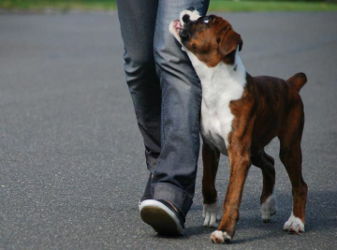 In assessing the temperament evidence of the following behaviours at any point during the assessment will cause a dog to fail: Display of fear. Display of aggression. Inattention. Mouthing. Panic. Growling. Cringing. Threatening behaviour. Hiding or avoidance. Over exuberance. Trying to run away. Jumping up (handler, stranger, assessor). Excessive barking. Biting. You can find out about all the exercises in CGC and where your dog can sit these assessments on the NZKC website. 21/04/2012 - NZ & Aust Ch Ronin Sip of Scotch CGCB (Lola) and Heromiari Faust at Ronin CGCB (Imp Aust) (Ronin) passed their Canine Good Citizen Foundation, and Bronze awards on the same day! In the near future we will be seeing a lot more letters after Ronin Boxers' names aswell as before. 26/05/2012 - NZ Ch Ronin Deal with the Devil CGCB (Quin) qualified for Canine Good Citizen and CGC Bronze.